I have been thinking lately about memory drawing. The topic was sparked by one of the books I’ve been reading about drawing by the director of The Arts Student’s League of New York City. The book is “The Visual Language of Drawing” and is by James L. McElhinney and several of the instructors at the League. “The Natural Way To Draw”, Kimon Nicolaides. At one point in the book, Mr. McElhinney mentions the 1930s instructor Kimon Nicolaides and his approach to teaching drawing. As a point of reference, the book “The Natural Way To Draw” is derived from the teaching notes of Mr. Nicolaides. James McElhinney lists some of the exercises that Nicolaides had student do and it includes “memory drawings”. Now then, my copy of “The Natural Way To Draw” is stuck away in storage. However, when I was starting out on my drawing and painting path, I read through Nicolaides book. At the time, I did not have access to a life drawing class and was struggling to find a way to start developing my artist’s skills. When I reached the memory drawing exercise I thought “Aha! This is something I can do anywhere, anytime!” And, so I did the exercises, or at least my version of Nicolaides memory drawing. I would say that memory drawing lead to my eventual “Peggy” style drawing which is a blend of memory and imagination. 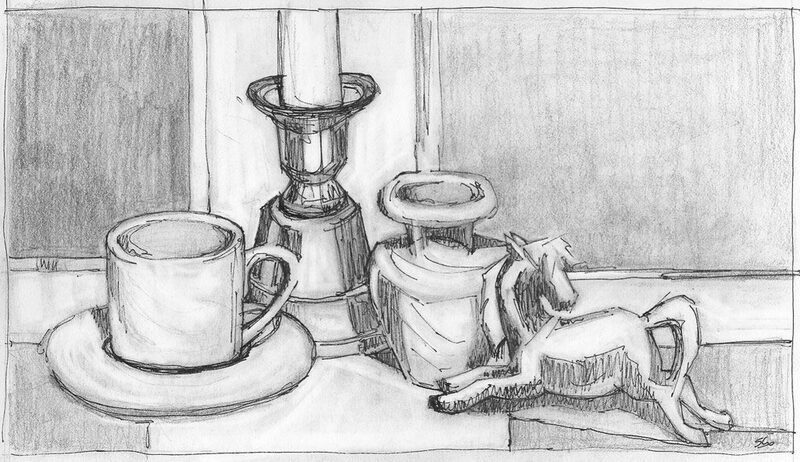 The first “Still Life with Toy Pony Drawing, March 2009. I drew this version from life and imagination. From time to time fellow artists have asked me how I come up with my designs, especially for series like “Still Life with Toy Pony”. Oddly enough, that is a hard question to answer. But, drawing from memory is a start toward explaining the process. If such a question interests you, please read on. Other times, people just like and enjoy to see the drawings and paintings. In which case, the narrative about memory drawings may not be so relevant. Instead, I hope you will find the works shown here interesting and enlightening. So, what is memory drawing? Its a way of drawing without direct observation; that is to say you are not looking at a model while drawing. So, this is what I learned and remembered from Kimon Nicolaides’ book. Disclaimer time first, though! I ought to mention that this is how I interpreted the lesson. If I read the book today, I might interpret it differently. In any case, here is the gist of the exercise: draw something you see during the day from memory; not from life. You might want to set aside say 20 minutes a day to do this type of drawing. Maybe you draw a car door handle, or a person opening the car door. Another idea might be to draw a person you meet on the street, in a coffee shop, or on a bench at a bus stop. And, the subject doesn’t have to be people. It might be a cat crossing the street; a horse in a field, or a plaster cast angel in your neighbor’s yard. Or, it could be a still life arrangement you find or set up. 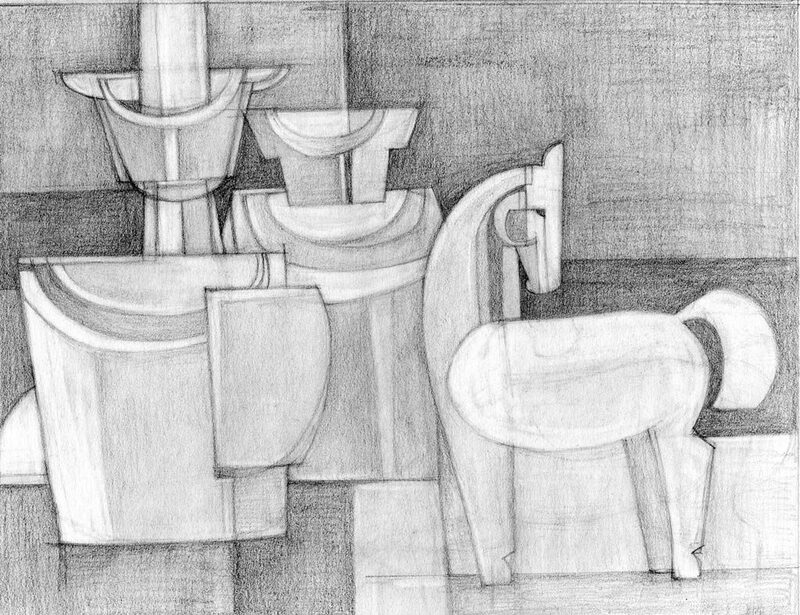 This is drawing number 60 of the Still Life with Toy Pony series. By this time, I was drawing exclusively from memory and imagination. Back to my personal experience and perspective. My routine has been to go out and do a jog most mornings. I have been doing this for years. After reading Kimon Nicolaides book, I thought I might pay attention to the people I pass while jogging. I would look at someone then try to remember an impression of the person. Then, I would set aside 20 minutes after breakfast and get to work drawing the person I’d seen while jogging. As you might imagine, at first the figures were stiff. The label “not very good” would have been appropriate. But, what I learned was that I became better at the memory drawing over time, especially if I saw the same person doing the same action – say walking down a beach. I would like to share what happens. Each time you see someone doing the same action, you take better mental notes. You see “what the legs do”, in other words the shape legs create while they are walking. Another day, you notice how the arms swing naturally while a person is walking. Next, you might notice the tilt of a head or how a jacket bunches up at the elbow. Each little observation becomes a mental note that helps you with your next memory drawing. 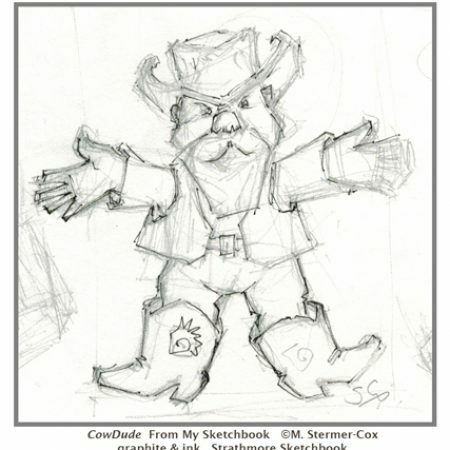 Oh, and, yes, the first memory drawings I did are stuck in storage along with my Nicolaides book. But, the process took! I still do this type of drawing when I start a series. Now, for those of you who like to draw from life, remember this is an exercise. And, life drawing is a form of memory drawing. Consider this, drawing from life is “look, remember, draw, look, remember, draw” and repeat. Unless you are doing a blind contour drawing, it might be said that you are doing “memory” drawing pretty much anytime you draw from life. In this case, you are holding a bit of information in your memory for a short time rather than the time I took to do my 20 minute memory drawing. Since I mentioned life drawing, I thought I’d talk about abstract drawing for a paragraph. 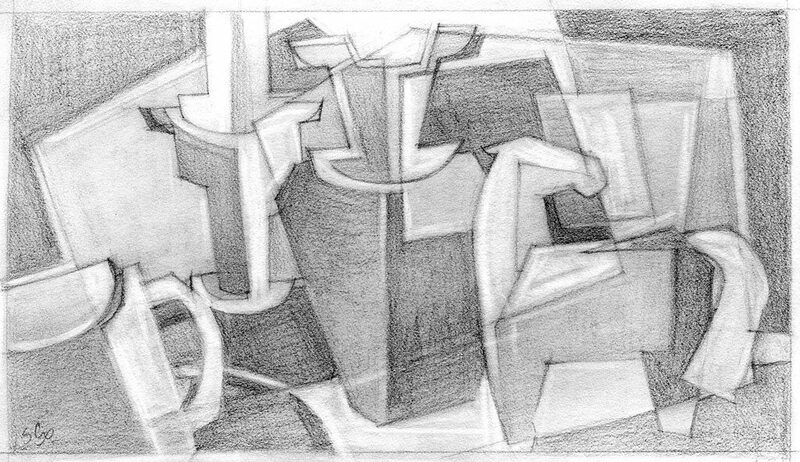 Drawing from memory is one way to “abstract” the essence of the subject. You simplify; you remember the main movement, gesture, color, or shape. That something that you remember can become a point of departure for a stylized, abstracted design. The memory of people, nature or things observed in life becomes the source of inspiration, improvisation and intuition. How Memory Drawing Influenced My Artwork. So, how did this memory drawing have an effect on my artwork? After awhile, I found that I saw interesting shapes while drawing. I gradually freed myself from trying to recreate my subject and started experimenting. Drawing became a type of dialogue between me, my memory, my drawing and my imagination. I can best describe the process as a “push and pull” type of drawing: pushing lines and shapes one way; then pulling them an opposite. I work this way until I gain traction and the drawing emerges on the paper. 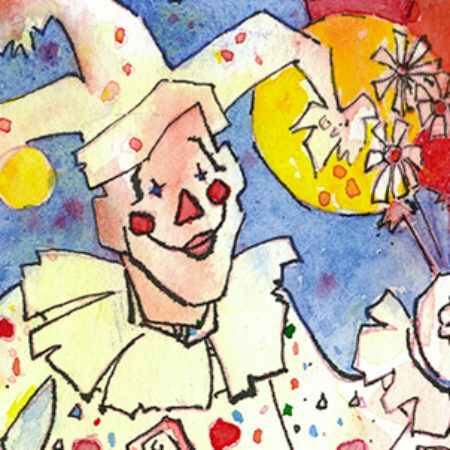 This type of “seeing, remembering, exploring” drawing is perfect for variations on a theme. That is to say, you start from what you see in life, then draw variations, allowing memories and imagination to influence your drawing. If you get stuck, you might go back to drawing from life. For me, this was a great way to get started on developing my drawing skills. All I needed was a sketchbook, a pencil, a kneadable eraser and off I went. OH, yes, you may erase. I did because it helps to push and pull the drawing into shape! And, another rule I employed for myself, don’t give up until you have given the drawing a serious try! “Still Life With Toy Pony” Series. OK, nice, all these words. But, how about results? 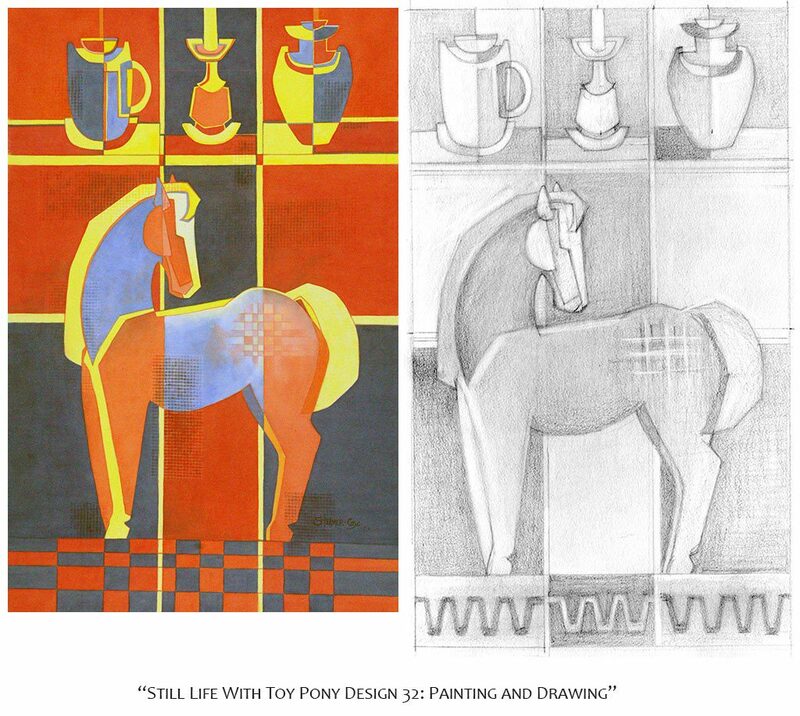 I have attached some of the drawings and paintings from my “Still Life with Toy Pony” series. The series was started by a drawing from life. As I started working variations, I worked from memory, then I transitioned to imagination. Imagination, in this case, might be said to be a modified form of memory drawing too. I incorporated what I remembered from the original still life plus all sorts of other ideas that popped into my head while drawing. 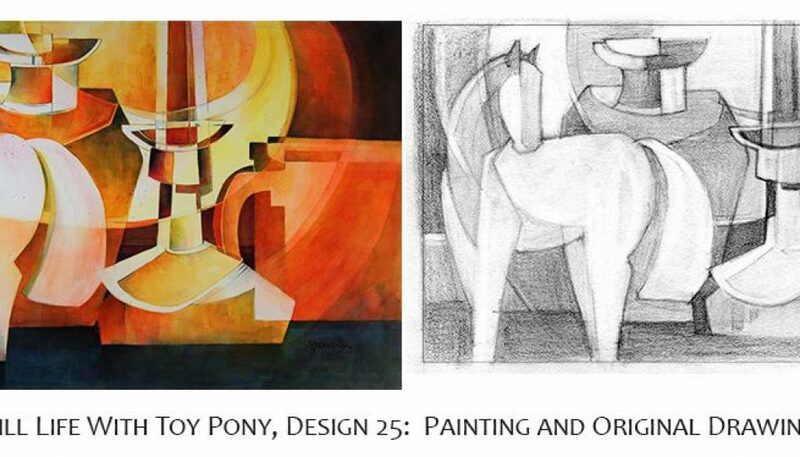 The “Still Life with Toy Pony” series marks a leap forward in my drawing, composition and painting skills. I’ve worked on it periodically over a six year period. And, who knows, I may yet re-visit the theme! Do you do a form of memory drawing? What are your experiences? Please feel free to share and add a comment. Thanks! I found more about drawing from memory on a website: Studio Rousar. Artist Darren Rousar has written a book titled “Memory Drawing”, plus he has several exercises and insights available for you. His exercises are different from mine and, incidentally, I thought I try a few out myself. Thanks! Update 2: October 1st, 2017. 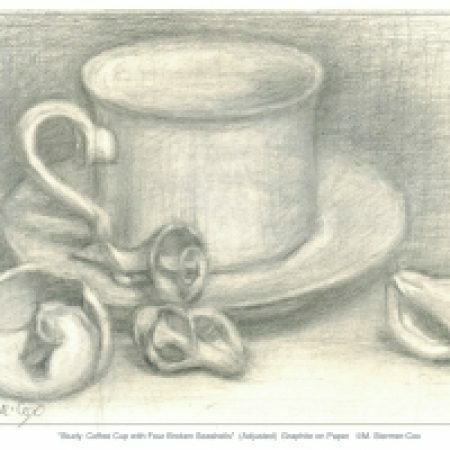 I would like to share another article that includes a memory drawing exercise. The website “Jen Reviews” has an article titled “How to Draw Better”. The article includes a tip, with discussion, on how to improve your short term memory. This is particularly important when you are interested in achieving a life-like drawing. One thing I like about “Jen Reviews” is that the discussion is backed up with scientific studies. In any case, all drawing from life involves short term memory. So working on improving it ought to help drawing skills.